Hinshaw, George, head-of-household, age 35, born Mch 1865 in Kansas; father born in Indiana; mother born in Missouri; married 17 years; occupation: day laborer; owned home (free). Hinshaw, William, son, age 14, born Dec 1885 in Oregon; father born in Kansas; mother born in Missouri; attended school 2 months. Hinshaw, Thomas R., son, age 7, born Nov 1892 in Oregon; father born in Kansas; mother born in Missouri. Stakely, Richard C., boarder, age 38, born June 1861 in Missouri; parents born in Tennessee; widower; occupation: farm laborer. 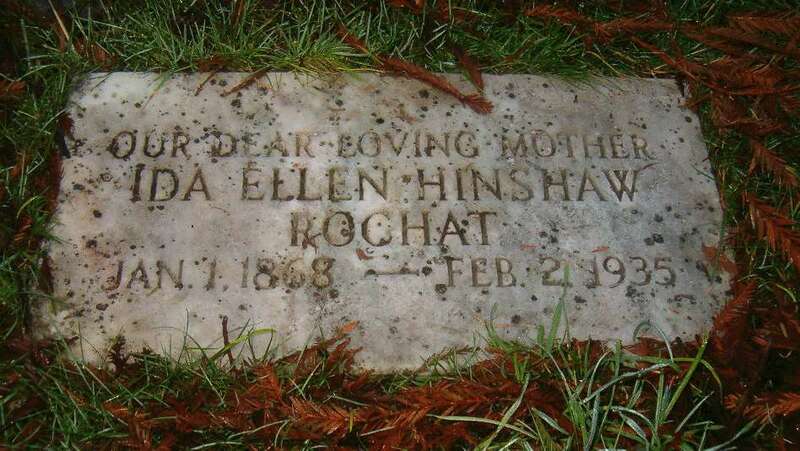 Rochat, Ida, head-of-household, age 52, born in Missouri; father born in Indiana; mother born in Missouri; divorced; owned home; occupation: none. Rochat [unclear], Ida E., head-of-household, age 62, born in Missouri; parents born in Indiana; divorced; owned home ($2600 value [unclear]); occupation: farmer, general farm. Hinshaw, William L., son, age 44, born in Oregon; father born in Missouri [sic]; mother born in Indiana [sic]; single; occupation: truck driver, truck mill; not a veteran. Hinshaw, Thomas R., son, age 36, born in Oregon; father born in Missouri [sic]; mother born in Indiana [sic]; single; occupation: wood cutter, wood yard; not a veteran. Hinshaw, George W., head-of-household, age 45, born in Kansas; father born in Ohio; mother born in Missouri; second marriage; occupation: laborer, odd jobs; owned home (mortgaged). Hinshaw, Ida, wife, age 44, born in Indiana; parents born in Switzerland; first marriage, married 5 years. "History of Polk County", Polk County Genealogical Society, Monmouth, Oregon, 1987. 1900 census, Wamic Precinct, Wasco County, Oregon; roll T623-1353, ED 150, page 3B, line #73, dwelling #58, family #68. 1930 census, Mad River Township, Humbolt County, California; roll T626-120, ED 29, page 1A, line #18, dwelling #4, family #4. 1910 census, 1st Ward, Dallas, Polk County, Oregon; roll T624-1282, ED 240, page 214B, line #85, dwelling #73, family #73. 1870 census, Mount Vernon P.O., Mount Vernon Township, Lawrence County, Missouri; roll M593-787, page 495, line #17, dwelling #238, family #236. 1880 census, Dallas Precinct, Polk County, Oregon; roll T9-1083, ED 105, page 468B, line #17, dwelling #45, family #45. Gravestone of Ida Ellen Stakley; photo courtesy of Karen Matlock (). 1920 census, Mad River Township, Humbolt County, California; roll T625-98, ED 58, page 6B, line #99, dwelling #144, family #155. (article written by Rhea Brooks). 1900 census, North Salem, Marion County, Oregon; roll T623-1348, ED 143, page 22A, line #20, dwelling #499, family #502. 1910 census, 1st Ward, Dallas, Polk County, Oregon; roll T624-1282, ED 240, page 214B, line #87, dwelling #74, family #74. 1910 census, 1st Ward, Dallas, Polk County, Oregon; roll T624-1282, ED 240, page 219B, line #85, dwelling #214, family #204.